There are several components to healthy hair care, maintenance, and styling. 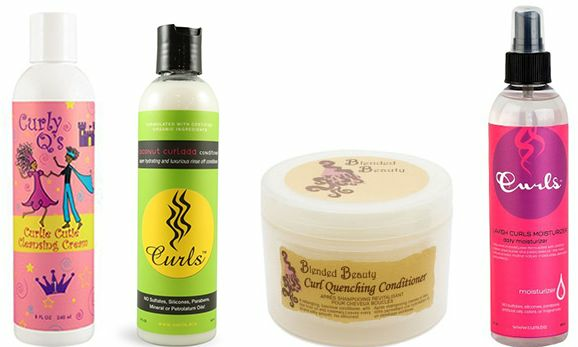 While some curly, wavy, and coily girls are getting by with only a few products, most of us need more products or better products to get the job of conditioning, moisturizing, de-frizzing, and styling done properly. Quite often we have no clue what some of these ingredients are or do, but as we become more aware of our hair needs, we examine the ingredient lists trying to find correlations between what our hair likes and does not like. It is one of the pathways to healthier hair, as knowledge is power, and understanding of ingredients allows for better choices in hair products. Not all “natural sounding” terms are natural and by the same token, not all “chemical sounding” terms are not natural. For example, water is a chemical. Learning the tricks of the trade for product marketing allows for a more informed consumer. We just want to make sure you are fully informed before buying a product with shopper remorse immediately after wash day. As we delve into foreign sounding ingredients stay open to the idea on trying something new to see if it works. You may just be surprised. Beantree is a natural, clear liquid derived from castor and rapeseed. This liquid, low in viscosity, has a light and dry, non-oily feel, which can easily and quickly be absorbed into the skin, including the scalp. Beantree is also known as the chemical ingredient, methylheptyl isostearate, which is an ester of caprylic alcohol and isostearic acid. Beantree is just a brand name for methylheptyl isostearate just as Kleenex is a brand name for facial tissue. This popular emollient was created by ALZO international Inc., which also develops specialty emollients esters, specialty surfactants, and conditioners. Beantree or methylheptyl isostearate works at preventing water loss form the hair’s surface so the strands do not dry out. It has a dry feel and often used instead of evaporating silicones. It adds a high gloss, or sheen. It is used in hair products and can be found in color cosmetics, skin care, and bath products. It will condition the scalp and hair while retaining moisture and absorbs quickly without leaving a greasy feel. It has excellent lubricating and emulsifying properties and seems to be a great replacement for silicones. A few brands have found this to be a viable ingredient in several of their products, namely Curls and Blended Beauty, but this may only be the tip of the iceberg for brands giving this non-oily yet moisture grabbing liquid a chance.